It’s a Cream Cheese Frosting with added cocoa. That’s pretty much it, but what comes of this marriage is the most divine union of chocolate buttercream and cheesecake. It’s light and dark at the same time and perfect piped on cupcakes or spread between layers of Chocolate Mud Cake, or slathered over cakes too. It can be rustic looking or super glamorous; it’s delicious and versatile. This is my go-to for all chocolate cake filling and frosting needs. Beat the butter until pale and creamy. Best done in a freestanding mixer though entirely doable with an electric handwhisk…. or by hand, if you are Popeye. 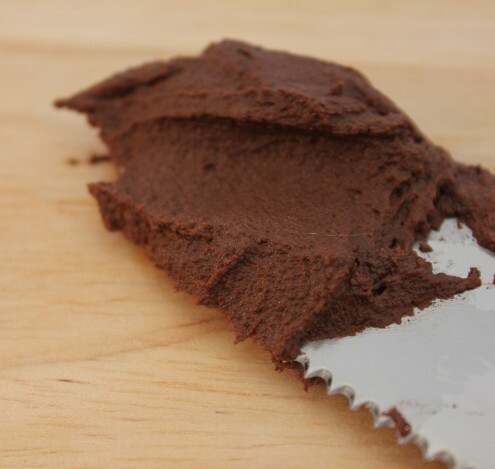 Add the cocoa powder and beat into a dark paste. You will need to scrape down the sides of the bowl and to the bottom a few times to get all of the butter incorporated. Add half of your cream cheese to the mixture and beat until combined. Remember that you will need to stop every now and then to scrape the sides of the bowl and encourage the chocolatey butter into the centre. Add half of your icing sugar and mix in completely before adding your remaining cream cheese. If the mixture looks runny with all of the cream cheese, do not panic too much as the icing sugar will bring it together. Add the rest of your icing sugar and continue to beat on a medium speed. Throw in a tablespoon or two of milk to prevent the frosting from getting too heavy and continue beating for around 5 minutes. The result should be a wonderfully light chocolate frosting.